Nicole's Needlework: Can't think of a title! First Cutaway Sleeve finished today! The start of my first Hourglass sleeve. 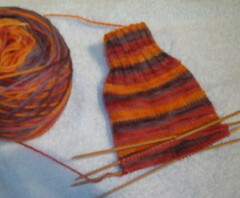 A little more progress on my Kool-aid sock. 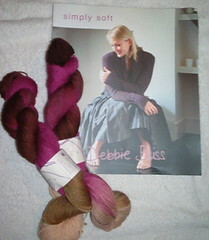 Lorna's Laces in the Vera colorway, and the new Debbie Bliss book "Simply Soft." While in Chatanooga I taught my friends how to knit and one picked up on it right away. I was so excited, and so was she. Hopefully she stays with it. 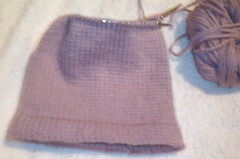 It would be great to actually have a knitting friend! Well, not much else. I have to get ready for work soon. Fun, fun!! Write more later! Hi i am totally blown away with the blogs people have created its so much fun to read alot of good info and you have also one of the best blogs !! Have some time check my link of wedding channel.